It is said, madness runs in families. 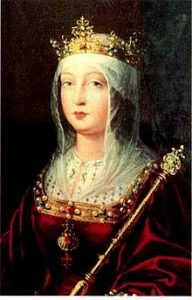 While Isabella of Castile became one of the most powerful female monarchs the world would ever know, her daughter, Juana, could not seem to find empowerment at any time in her life, even when she became Queen of Castile. Suffering from bouts of ill temper, melancholia, jealous rages and utter despair, Juana was proclaimed “mad” early into her marriage and she never successfully alluded the title. Both never intended for the throne, Isabella and her daughter Juana came to their prospective reigns through the untimely death of siblings, and also through powerful alliances in marriage. Both raised at court, they received the finest education a princess could receive, but their lives, and any hope at happiness in their younger years, came at the mercy of their male superiors and overbearing mothers. Isabella’s mother, known as Isabella the Mad, often flew into paranoid rants about ghosts or people wanting to kill her or her beloved. Raised under the reign of her half-brother Henry IV, Isabella endured several betrothals and refused one or two before she married the man she had first been intended for, Ferdinand of Aragon. Knowing her half-brother wanted an alliance with Alfonso of Portugal, Isabela fled from her brother’s court to Valladolid, and married her second cousin, Ferdinand. Although having given birth to five children, Isabella had little time to raise them. Juana, the third child, an extremely beautiful, intelligent and sensitive girl, started exhibiting strange behaviors when her mother became ill, or traveled away from court. The young princess often locked herself away and refuse to eat or sleep. 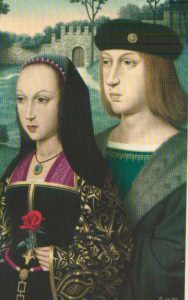 In 1496, Isabella sent Juana, aged 16, accompanied by a fleet of over 100 ships, to Flanders to marry Phillip the Fair, or Phillip the Handsome, the heir to the Austrian empire. The alliance would strengthen Spain’s presence against the power of France, and align it with Flanders, the top producer of Iberian wool. After the setback of a tremendous storm delayed the arrival of the princess, the two teenagers finally met, and fell in love at first sight. With the wedding set for the next day, the two decided they could not wait, and had a priest marry them immediately. But the passionate luster soon wore off for Phillip, known to love his wine and his women. When Phillip misbehaved, Juana flew into long, drawn-out jealous rages, or took to her rooms, refusing food or drink for days. Despite their marital troubles while living in Flanders, Juana became pregnant. She first gave birth to a daughter, Eleanor, in 1498, and then Charles in 1500. During this span of time, Juana’s elder brother John and her sister Isabella both died, leaving Juana heir to the throne of Spain. In order to keep an eye on Juana, who’s public displays of ill-temper had become renown in Flanders, and Phillip who’d become too lenient with France, Isabella and Ferdinand encouraged the couple to move to Spain. If they were to inherit the realm, they needed to be schooled for their eventual accession to power. Finally, in 1502, Juana and Phillip arrived in Spain where Juana was recognized as Isabella’s successor and Phillip her consort. Feeling like a fish out of water, Phillip soon returned to Flanders, but Isabella would not allow Juana to leave with him. Desperate without her husband, Juana resorted to her melancholic state and refused to eat or drink. Phillip wanted Juana back in Flanders as badly as Juana wanted to be there, but for different reasons. He wanted his wife out of Spain’s control. Isabella feared that Spain would revolt should Juana try to rule from Flanders, so the tug of war continued until 1504, when fearing for her daughter’s mental stability, Isabella let Juana return to Flanders. But love and life did not improve for Juana. Phillip continued his affairs and Juana continued her embarrassing public outbursts. These public displays of outrage and then overt affection toward Phillip only made Phillip despise his wife more. He had her locked away in her rooms. More sad news would reach Juana a few months later when she learned that her mother, Isabella, had died. 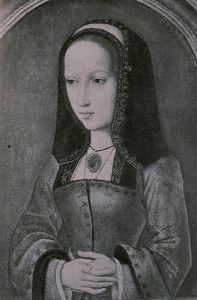 Her father, Ferdinand, in order to keep control from Phillip, claimed Juana incompetent to rule, and he intended to rule as regent until his grandson Charles became of age. To thwart her father’s plan, Juana and Phillip sailed for Castile in the hopes that powerful nobles who opposed Ferdinand would side with Juana. They did. Ferdinand then remarried hoping to beget another son to take the throne from Juana’s control. In 1506, perhaps tired of working around Juana, Ferdinand and Phillip made an alliance. Without Juana’s knowledge, the two men met and declared Juana unfit to rule. Ferdinand turned Castile over to Phillip and Juana in a monetary exchange, knowing that Phillip would wrest control from Juana, but also that Spain would likely not accept a foreign ruler. To everyone’s surprise, in late 1506, Phillip fell ill with fever (some say poison.) Juana nursed him around the clock for six days until he finally succumbed. Bereft, Juana, according to chroniclers of the time, had her husband’s coffin reopened on several occasions so she could caress his face and look upon him. These claims were probably exaggerated by Ferdinand and then later, Juana’s son Charles, to discredit her and thwart any hope of her rising to power, again. To Ferdinand’s relief, Juana had no interest in ruling, and in 1507 she turned the government over to him. In return, he had her imprisoned in Tordesillas castle, where she continued her bouts of refusing to eat or sleep. When Charles finally came into power after the death of Ferdinand, he did not treat his mother much better than Phillip or Ferdinand had. But, the people loved her, and often rallied to her cause, but Charles clamped down even harder on his mother because of her popularity. She finally enjoyed about 8 months of freedom before she died. Was Juana actually mad, or did she possess a tender heart and have a sensitive nature? 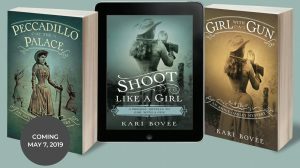 Did she suffer from bi-polar disease, or did she pose too much of a threat to the men in her life who wanted power above all else? We may never know. I wonder if Isabella had lived longer, would she have come to the defense of her daughter, or would she have treated her as ruthlessly as she did the others she deemed weak? I would hope the former, but then, I’m an eternal optimist.